Canyon Dam Outlet Tower Stem Replacement - Global Diving & Salvage, Inc.
Pacific Gas and Electric contracted Global for a stem replacement project. 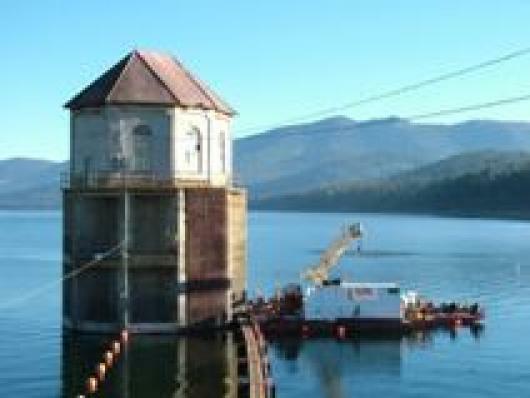 Canyon Dam Outlet Tower in Lake Almanor, CA stands in approximately 85 feet of fresh water at 4,500 feet of elevation. To perform the project, Global mobilized a portable barge system, a surface-supplied dive spread with decompression chambers, and a 20-ton hydraulic crane to the lake. The crane was driven onto the barge to assist with removal and replacement of large stem sections. Global replaced approximately 80 lineal feet of stem, including stem guides and roller assemblies. The existing stem was attached to the vertical slide gate with rivets that were drilled out, enabling re-utilization of the holes to exacting tolerances. To remove the existing stem, divers utilized a hydraulic-driven magnetic drill press. Upon completion of the stem replacement, the stem was tested and performed within tolerances. The project was performed safely, efficiently, and within budget.